It is with joy that I inform you of the acceptance of a call for our Senior Associate Rector, by the Rev. Ann Gillespie. Ann is an extremely talented priest -- preacher, teacher, pastor, and liturgist. I am delighted for what her companionship and leadership will mean to us all at Holy Comforter. An additional title for Ann is Director of the Center for Wellness and Spirituality (more about this coming soon) at Holy Comforter as we consider ways to communicate so much of what we do to the outside world. She will help us to further develop and support this kind of work here. I give thanks for the thoughtful and prayerful work of our discernment committee, and for their care for all the candidates. Please thank Katie Krogh, Andrew Payze, Christa Hyland, Susan McGuire, and our wardens, Kip and John for their support. Please join me in welcoming Ann as she begins here June 1, 2019. The Rev. 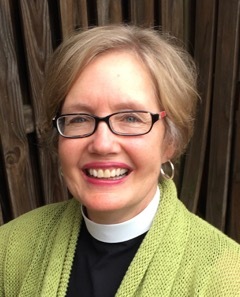 Ann Gillespie served as Senior Associate Rector at historic Christ Church in Alexandria, VA for over ten years. Her purview there included Worship, Pastoral Care, Adult Faith Formation and other contemplative spirituality initiatives. She also led several parish pilgrimages to the Holy Land. She came to parish ministry by way of twenty years as a professional actress and twelve years as a hatha yoga teacher. Currently, she is serving as the Consultant for Ministry and the Arts in the Lifelong Learning department at Virginia Theological Seminary. In 2017, she completed an MFA in Creative Writing through Seattle Pacific University.